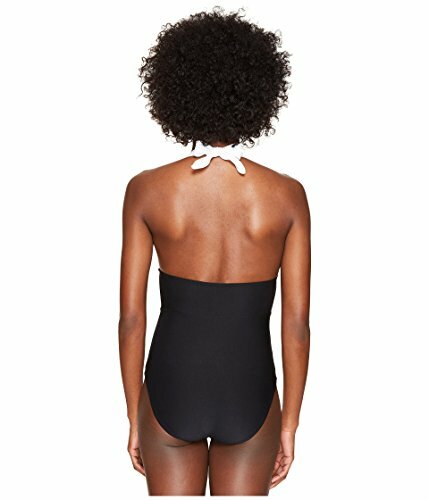 Kate Spade New York Swimwear Size Chart Be seen in the Kate Spade New York™ Carmel Beach One-Piece Swimsuit. V-neck. Tie halter straps. Color blocking along bust. Removable cups for added lift. Tassel tie at center bust. Full rear coverage. Shell: 84% nylon, 16% spandex. Lining: 92% polyester, 8% spandex. Cups: 100% polyurethane. Hand wash cold, hang dry. Imported. This item may ship with an attached security tag. Merchandise returned without the original security tag attached or a damaged tag may not qualify for a refund.